Traditionally New Year is ushered with crackers and merrymaking, booze and food. But this year, at least to those who love Art, dawned on a magnificent musical note: finally they felicitated, in fact honoured, Sri Lanka's only living melody: Haroon Lantra. It was long overdue. So the sponsors of a musical variety show who boldly ventured to fill this lacuna should be complimented; they deserve a warm New Year embrace for their endeavour. 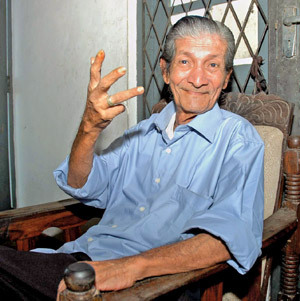 Tuan Haroon Lantra almost touching eighty, has been (and is) languishing in penury - a stark tragedy in the Lankan philistine society where if you are an artist you are condemned to live in poverty. Ours is a politics-oriented society, a cricket-oriented society. Currently these are the most lucrative professions and a father, wisely aware of the game of success as it is played now, will warm his art-conscious son: "Don be a nut; take to politics or cricket." Haroon Lantra now has only his song to keep him company. His golden voice, unsurpassed in the local musical fraternity, will be ringing to relieve him of the anguish he must surely feel in the last years of his life. I remember Haroon in his early youth in Maradana. It was the mid-fourties. At a carnival at the Ananda Balika Vidyalaya Lantra took the microphone kept for urgent announcement and crooned some of the sweetest songs of Talat Mahmud - his favourite and idol, King of Ghazals in India. Everybody stood still at the carnival grounds at the melodious voice came over the loudspeaker. In the early fifties, Bombay's celebrated film singer Mohammed Rafi came to Sri Lanka (Ceylon then) to sing. He was to sing at the YMBA Hall in Borella. It was the pre-sophisticated electronic age and a solitary loudspeaker hung at the end of the crammed hall. There was also a single microphone on stage. Rafi was visibly unhappy - he was not sure of the acoustics of the hall. He asked the organizers to get someone to sing over the mike. They picked on Haroon Lantra who had come to listen to the famous Hindi Singer. Lantra sang sweetly one of Talat Mahmud's popular numbers - Rafi was amazed. He went up to Lantra and shook his hands and asked (because he had sung a Talat's song and not his) "Why, don't like my songs?" Lantra replied: "I do, but I like that (Talat Mahmud's song) also." Rafi then said: "Come to India - you'll have a future there!" Haroon Lantra did not go to India. As for his future in Sri Lanka - we all know what has happened. Lantra's God-given voice (Haroon might say Allah's gift - Inshaah Allah!) which cascades like a murmuring brook touching your very soul, is perhaps in some aberrant form his nemesis too: established and successful singers feared his voice, they were jealous of his voice. He was cornered. He lacked the skill of one-upmanship; he did not practice the art of servility and did not bum anybody: traits essential to become a successful singer - the voice or the ability to sing did not matter, what mattered was who you bummed and who you knew in order to bum. Lantra lacked all these 'qualities'. Lantra has been singing for almost sixty years and his singing career has hung on his like a sin: he has not been duly rewarded by society or by the State. Rafi may have hinted that the saying was right - ' a prophet is without honour in his own land.' Lantra was also a competent tabla player but singing was his forte. He detested western music and called hilariously the pop variety of local singers as Dunthel Sangeethe. For sometime he sang Islamic songs over the old Radio Ceylon. The enterprising and generous musician and noted violinist Stanley Oumar had some Malay songs recorded by him to his music. The late Maestro Premasiri Khemadasa was one who recognised the talent of Lantra - he got Haroon to sing for his ballets and films. Khemadasa had the unerring eye to discern the mellifluous nuances of Lantra's voice.